The Red Fort of Shahjahanabad in Delhi is a monumental addition to the Mughal emperor Shah Jahan’s already impressive architectural legacy. However, as opposed to a structure like Shah Jahan’s Taj Mahal, the Red Fort was intended to be lived-in architecture. The Fort’s existence, stretching from the height of Mughal power through its decline, the colonial period and the final triumph of independence has been a history of occupation and usage. With that history of usage comes a history of representation. Shah Jahan decided to move the Mughal capital from Agra to Delhi in 1639, and as a result Delhi needed a new imperial fort worthy of the Empire. The Red Fort was planned as a component of the larger imperial settlement of Shahjahanabad, and it was positioned at the banks of the Jamuna River in such a fashion that ensured it would rise up as the most majestic structure in the landscape. The Red Fort’s red sandstone walls came from rock quarried at Fatehpur Sikri, the erstwhile capital of the previous Emperor Akbar; these walls were built in an a roughly octagonal shape and extended for almost two miles. In one of the earliest depictions of the Red Fort, it is in fact only these walls that make an appearance. The miniature painting above dates to the 17th century, therefore approximately contemporary to the completion of the build and original entering of the Fort by Shah Jahan. 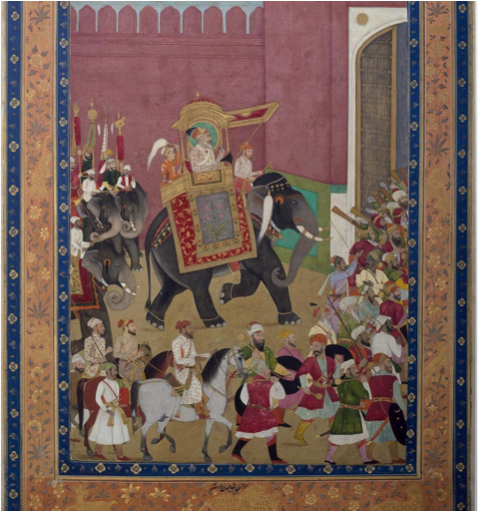 The scene itself is quite resplendent, with Shah Jahan in the center on a heavily adorned elephant and surrounded by nobles and soldiers, all entering the Fort in a large procession. Though the Fort hardly features as a central character in this miniature, it is important that the painting commemorates the event of original occupation. By portraying this as a momentous and celebratory event, the miniature indicates the importance of the Red Fort in constructing imperial grandeur and authority. With the construction of the Fort, Delhi is now worthy of becoming the center of Mughal authority and the Fort serves as a symbol of that power. As such, this image serves as a useful starting point for an exploration of how the Fort was depicted in subsequent art. The Fort was a multipurpose structure from its establishment, housing both public areas such as community gardens, residential areas for soldiers and members of the court’s administrative structure, as well as, of course, the private imperial domains. Some of the original components of the interior of the Fort include the Diwan-i-’Am (Hall of Public Audience, for public viewing of the Emperor and redress of grievances), the Rang Mahal (Colour Palace), and the Mehtab Bagh (Mehtab Garden). However, this original configuration was not eternal, as subsequent emperors also made additions of their own. For example, the Emperor Aurangzeb built the Moti Masjid in the late 17th century near the private imperial domains. Moreover, just as the original layout of the Fort was not eternal, neither was the stability of Shah Jahan’s reign. In 1739, the invasion of the Persians under Nadir Shah caused significant damage to the larger city of Delhi. After this invasion, regional invaders such as the Marathas and Jats also attacked Delhi and damaged the Fort in particular. In this period of crisis in the late 18th century, parts of the Fort went into disuse and neglect. Nevertheless, a painting of the Red Fort that dates to 1790 does not seem to reflect either this deterioration of Mughal authority or that of the integrity of the Fort. The painting above is an aerial view of the Red Fort by an anonymous artist dating to 1780–1790 and it serves as a powerful example of the usage of the Fort as an image with metaphorical meanings. It utilizes an interesting vantage point, raising the viewer above an imperial jharoka from which members of the royal family could look out onto the banks of the Jamuna and observe their domains. By reversing this relationship, the artist creates an almost anthropological viewpoint that records happenings in the Fort, creating an omniscience that lends a sense of truth and documentary to the scene. 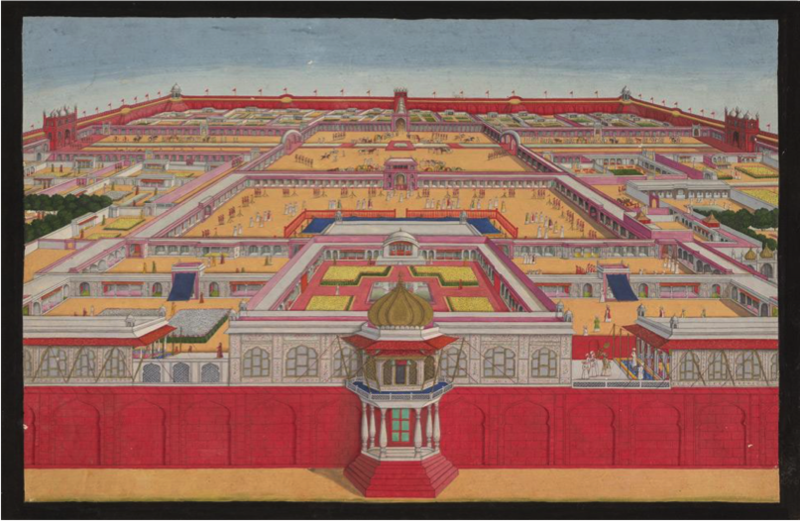 In this painting, the Red Fort is depicted as a vibrant site of activity. One can see two processions entering from two gates on cardinal axes, one procession presumably being that of the Emperor Shah ‘Alam. Also on view is a crowd that appears to be preparing for a public audience of the Emperor. The women’s quarters are even visible, with its occupants roaming about and interacting with each other. The entire composition is done in bright and rich colors, adding another dimension of liveliness to the scene. This representation of a peaceful and bustling imperial life is contrasted in telling ways with the actual condition of the Mughal Empire in Delhi in the time of this painting’s production. According to the historian C.A. Bayly, in the 1780s Delhi and surrounding areas were hit by famine, invasions of nomadic herdsmen, and a disruption of the agricultural system that supplied Delhi. Such a dire situation is certainly not reflected in the painting above, which instead chooses to portray an empire untroubled by such crises. This leaves one to explore the motivations of the artist in painting such a scene at a time of considerable turmoil. Considering the image of the Red Fort as a symbol of Mughal authority, first advanced in the miniature of Shah Jahan entering his new palace-fort, a painting of the Red Fort teeming with people and prosperity was perhaps used as a propaganda move in combating any damage done to the image of Mughal supremacy and enjoyment of divine favor by these nomadic incursions and environmental disasters. In such an image, then, we see an increased focus on the Fort as a symbol and the exploitation of that symbol to serve political, propagandistic ends. This reliance on the Fort as a symbol of strength and order was continued after their conquest of India under the East India Company and later the Imperial British Raj. However, it is not without difficulty that the British gained the privilege of claiming the Fort as their own. After the British took control of Delhi in 1803, the Mughal emperor was reduced to a ceremonial figure with little political influence. However, the cultural significance of the figure of the Mughal Emperor was important enough that the British sought to gain legitimacy by adopting certain Mughal symbols such as a currency with the emperor’s name on the coinage. However, it was only with the Indian Rebellion of 1857 that the British finally deposed the Mughal Emperor, whom they tried for treason in the Red Fort due to his role in leading the Rebellion against East India Company rule. Here again the Red Fort becomes a locus of the construction of authority in Indian history — it quite literally becomes the site of a transfer of authority from the deposed Mughal exiled from the Fort to the newly established British Raj, which assumed full administrative responsibility in India following the Rebellion. British art of the period shortly after the Rebellion reflects this transfer of authority, since the way the Fort features in painting is different from what is depicted in the 1790 aerial view of the Fort pictured above. An example of this shift is given in Figure 3, a chromolithograph from 1867 by William Simpson. While it is possible that this in an imagined scene, it nevertheless has metaphorical resonance in understanding the Fort as a locus of claims to imperial power. The difference of portrayal in this image is striking; gone are all the trappings of royalty, replaced by European children playing on what used to be the Mughal emperor’s grounds. In the lithograph the Fort loses the bright red seen in 1790 that was a slightly more accurate match for its red sandstone, and is instead brown and washed-out in color. This contrasts with the children and their nannies who are dressed in richer colors. This lithograph, pushing the Fort to the background ten years after the Rebellion that resulted in the pushing out of its previous inhabitants, is emblematic of the conquering presence of the British. 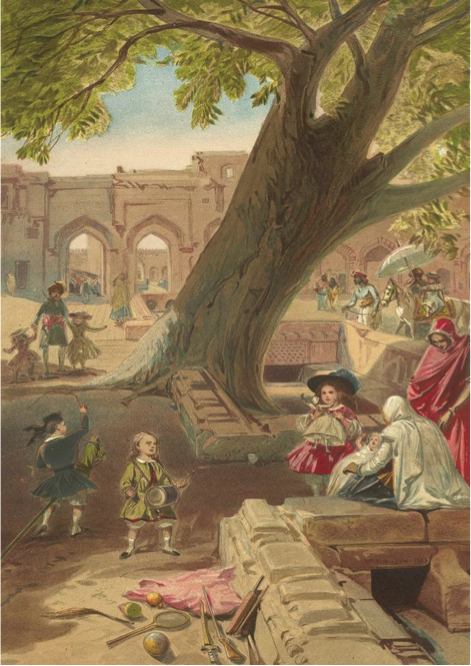 The sight of children playing on what was once a space of grandeur and authority serves to drive home the point that the British have defeated Mughal power and established their own authority over the Indian populace. This change in representation aside, the British were not to ignore forever the relevance of the Red Fort as a recognizable symbol of the strength and legitimacy of the ruler. While after the Rebellion the Red Fort was largely turned into a military cantonment and many of its buildings were demolished , by the 1900s the Fort was again being used as a visual representation of the Raj’s dominance. 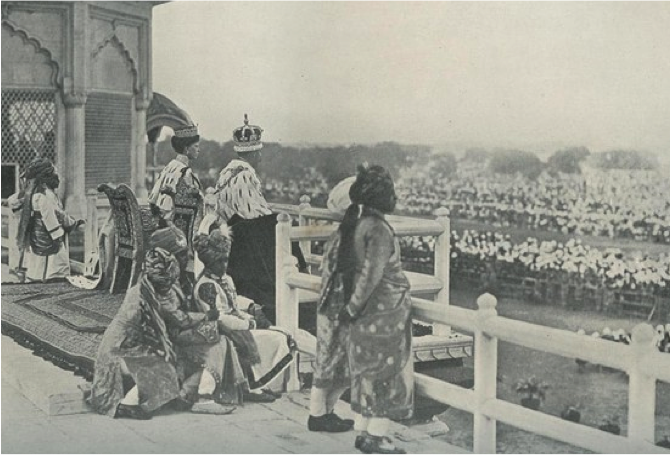 At the coronation of King George V in 1911 in Delhi , the King addressed the audience at his Coronation from one of the balconies of the Red Fort, a moment which was captured in photography. Not only is this reminiscent of Mughal practice of the ruler and his subjects viewing each other, drawing a connection to from George V to the Mughals of old; it also reflects the return to usage of the Red Fort as a ceremonial tool of the “benevolent ruler” rather than a decrepit symbol of the vanquished as depicted in the 1867 painting. In this era the British used the Red Fort to create an imperial history, placing themselves in the role of successor to the last imperial rulers of India. The British imperial dynasty was not to last much longer into the 20th century, however, and with the loss of Empire came another strategic usage of the Red Fort to enact and represent governmental authority. To date, the final transfer of power symbolized by the Red Fort is the passage from British imperial rule to Independence. On August 15, 1947 Jawaharlal Nehru, India’s First Prime Minister, addressed the newly independent nation from the Red Fort and hoisted the Indian flag on its ramparts. The Red Fort, so long a symbol of imperial power, came to signify the strength of the democratic Indian post-colonial state and the victory of the nationalist movement. In its new incarnation, the Fort represents not only state power, but also triumph against an unjust and illegitimate government, making it a complex monument in the contemporary period for rulers and citizens alike. This post originally appeared on Zerbaghali.